I find myself stopping at this spot every time I am in town and looking exactly at this view. At my back was a building that used to be a Gap. 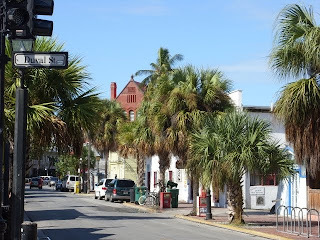 On Duval Street. I can't really think of a worse place for a Gap. Imagine getting on a cruise ship and going to your port and saying "Hey, I want some knock off of Levi Jeans to wear when I get to Cozumel"! Neither could the tourists since the place closed and is now a no name clothing store like all the rest. To the right is Zero Duval street where the Sundown Celebrations happen every evening. Its a great excuse to rub shoulders and have a beer and soak in the vibes as the sun gives its performance over the islands and the sea to the Gulf of Mexico. Forward is Mallory Square, where the Conch Train and the shell shops are there to separate tourists from their pocket change. Always a nice place to cool off and you can get a drink if you need it while exploring.